Snegurochka, the Snow Maiden, is a popular seasonal figure in Russian culture. In her most recognizable form, she is Ded Moroz's granddaughter and companion as he delivers gifts to good children in celebration of the New Year. The older incarnation of Snegurochka can be seen on Russian lacquer boxes and on nesting dolls—this Snegurochka is a character from a fairy tale that does not relate directly to the Ded Moroz legend. Whether you're traveling to Russia during winter or you're shopping for souvenirs, you'll want to be familiar with the story of Snegurochka and other popular tales about Christmas time and winter. In the Ded Moroz legend, Snegurochka is the Russian Santa Claus's granddaughter and helper and lives with him in Veliky Ustyug. She is most commonly depicted with long silver-blue robes and a furry cap. Just as Ded Moroz appears in various interpretations during the holiday season impersonated by men in costume, so does Snegurochka assume new guises around Russia to help distribute gifts. Snegurochka's name is derived from the Russian word for snow, sneg. The tale of Snegurochka, or The Snow Maiden, is often beautifully depicted on hand-painted Russian crafts. This Snegurochka is the daughter of Spring and Winter who appears to a childless couple as a winter blessing. Unable or forbidden to love, Snegurochka remains indoors with her human parents until the pull of the outdoors and the urge to be with her peers becomes unbearable. When she falls in love with a human boy, she melts. The story of Snegurochka has been adapted into plays, movies, and an opera by Rimsky-Korsakov. 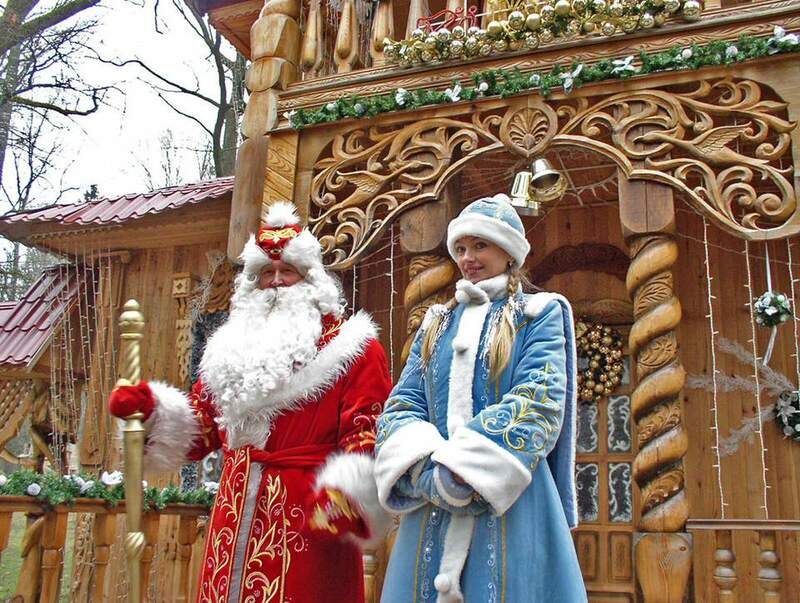 The Russian fairy tale about Snegurochka is different from a fairy tale in which a young girl comes in contact with Morozko, an old man who is more analogous to Old Man Winter than Santa Claus. To English speakers, however, the distinction can be confusing because Morozko's name is derived from the Russian word for frost, moroz. In translations, he is sometimes referred to as Grandfather Frost or Jack Frost, which does little to distinguish him from Ded Moroz, whose name is most commonly translated as Grandfather Frost or Father Frost. Morozko is the story of a girl who is sent out into the cold by her stepmother. The girl gets a visit from Old Man Winter, who bestows upon her warm furs and other gifts. In 1964, Russian live-action film production of Morozko was made. Another winter-related legend that is often depicted on Russian hand-painted crafts is the story of the Snow Queen. However, this story isn't originally Russian; it's by Hans Christian Anderson. This story became popular after it was released in film form by Soviet animators in the 1950s. In folk art, the Snow Queen may share some physical similarities with Snegurochka. If you are in doubt, check to see if the object is labeled “Снежная королева” (Snezhnaya koroleva) which is “Snow Queen” in Russian. In tales about snow maidens and grandfatherly personifications of frost, it's possible to detect the Russian affinity for winter, the season which blankets many parts of Russia more completely and for a longer period of time than in other parts of Europe. Folk art illustrated with these fairy tales make souvenirs that are uniquely Russian, and film and theater adaptations of these stories will both entertain and educate the viewer about this aspect of Russian culture.